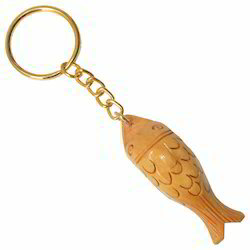 Fine Decorative Wooden Fish Keychain Available In Different Designs & Sizes. This is a awesome style brass fish key chain. This wonderful little keychain makes for an ideal gift to friends, family, employees, clients, co-workers and especially your self whether you are a nautically inclined, a full-fledged collector, or just looking for something intriguing and new. 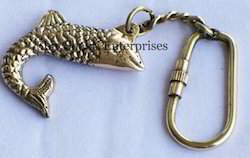 We have solid brass fish key chain. This is a beautiful key chain. Key Chain Fish Hand Braided With three color fabric from our chindi collection making use of all the scrap. Available in Acrylic and Wood.